Tails in the City — your dog deserves a stylish blog! 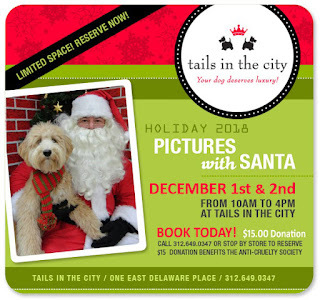 Tails in the City blog is an extension of our Chicago pet boutique store. Read our blog and discover what we feel is "in style" for your pet. In addition to the latest pet fashion trends, we will post about interesting things to do with your dog in Chicago, travel tips for your pet, favorite places to dine in Chicago with your pet, health and nutrition tips for dogs, and so much more! Tails in the City Pictures With Santa December 1st and 2nd!